While the whole world is waiting for the highly-anticipated next generation iPhone – iPhone 5 (also rumored as iPhone 4S), it’s surprise to hear that Apple has just launched the unlocked version of its popular iPhone 4 in the United States. As you know, the unlocked iPhone 4 of GSM model is not SIM-lock, and is not tied to any mobile carrier. In other words, an unlocked iPhone can be used on any mobile networks, any SIM cards, including overseas mobile carriers, perfect for folks who want to have flexibility to switch mobile operator at any time. In other countries, the unlocked iPhone is not necessary contract-free with no service agreement commitment. iPhones in most countries worldwide are of unlocked version, although the customers may still have to sign up for a contract to get subsidized pricing on iPhone. However, currently all unlocked iPhone is sold via Apple Store which does not have requirement to sign a line with any mobile operator. And all purchase of subsidized iPhone via AT&T will still be SIM-locked. And thus, you have to pay a steep full price for the unsubsidized unlocked iPhone, although the official price is considered to be one of the lowest in the world. To activate the GSM version of unlocked iPhone 4, you just need to insert an active micro-SIM card from any supported GSM mobile carriers around the world, then complete the setup process via iTunes by attaching your unlocked iPhone 4 to your computer (iTunes-free activation is possible when iOS 5 is released). One of the foreseeable benefits for unlocked iPhone is for frequent travelers, who want to use a local mobile service with local SIM card to avoid the expensive roaming charge. It also allows people with multiple mobile lines to switch and use multiple SIM cards with the one iPhone. Only GSM-version (AT&T iPhone) of unlocked iPhone is available. The CDMA version of iPhone is SIM-free, and continue to be tied to Verizon Wireless. 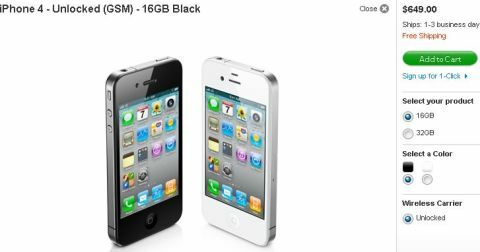 The unlocked iPhone 4 that available in black or white color is now available at Apple Store with a price tag of $649 (16GB) and $749 (32GB), respectively.